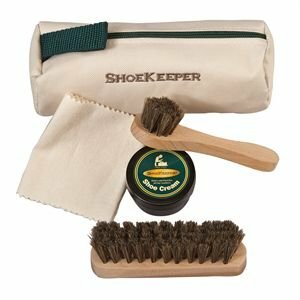 Travel Shoe Care Kit:The Travel Shoe Care Kit contains everything you need for a quick shine on the go: black shoe cream, horsehair brush, horsehair dauber and flannel shine cloth in a zippered canvas travel bag. The Travel Shoe Care Kit contains everything you need for a quick shine on the go: black shoe cream, horsehair brush, horsehair dauber and flannel shine cloth in a zippered canvas travel bag. If you have any questions about this product by Dover Saddlery, contact us by completing and submitting the form below. If you are looking for a specif part number, please include it with your message.